Proper care and tank maintenance keeps your fishies alive and well for years. Hopefully, you don't think of aquarium fish as short-term pets requiring minimal care. When raised right, most finned friends live for years -- even goldfish can last 20 years. If you measure fish lives in months, you probably need to pay more attention to proper feeding, water chemistry and routine maintenance. Uneaten food pollutes your scaly swimmers' environment and inhibits filtration, so it's important not to overfeed -- an area where many fishkeepers go wrong. How do you know how much to feed? First, most fish should eat only once per day. Provide just as much as they can eat within five minutes. Also, watch for when they start spitting food out; that means they're full. Getting the quantity right is a process of trial and error, so keep at it. Different fish have different dietary needs. Some like seafood, others are vegetarians and others still are omnivorous. Research what your species require, including whether you should offer them supplemental fresh-frozen or live food. Choose a high-quality flaked fish food for smaller fish and surface and midlevel dwellers; choose pellets for larger fish and bottom-dwellers. Rotate between a few different brands day by day to provide nutritional balance. Also, be aware that containers of fish food lose flavor and nutritional value quickly once they're opened, so buy small packages rather than bulk sizes. Most fish need water between 75 and 80 degrees Fahrenheit, pH between 8.0 and 8.4, gravity between 1.020 and 1.024 if they're saltwater critters, the nitrate level below 20 ppm, and nitrite and ammonia levels at 0. Install a thermometer and pick up a water testing kit; use it daily until your aquatic environment and water cycling are established; after that, you can switch to weekly or biweekly. Generally, there's no need to hyper-focus on exact target numbers. Instead, it's essential to prevent significant fluctuations in water readings; your fish adapt to the environment they're in, but once they adjust, sudden or drastic changes easily cause stress, illness and even death. A thriving aquarium takes consistent effort, so don't think of your fish as low-maintenance pets. You need to care for your aquarium equipment per the manufacturer instructions and confirm it's all clean and running smoothly every day. Replenish evaporated water every day or two; remember, salt doesn't evaporate, so refill saltwater tanks with fresh water. Clear out debris and empty your protein skimmer daily, too. Algae magnets and substrate vacuums are useful tools for the aquarist. Don't forget your 10 percent water change every two weeks. Fish are susceptible to countless infections and illnesses; bacterial and parasitic are most common in home aquariums. Appearance and behavior changes indicate something's wrong. Observe your swimmers daily to familiarize yourself with what's normal so you can catch abnormalities early. 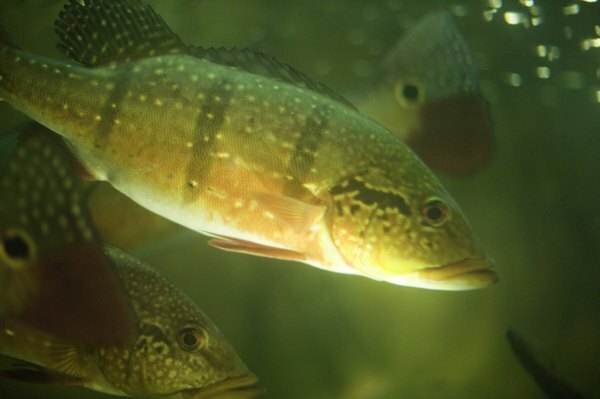 Watch for things like red streaks, fuzzy whitish patches, discoloration, paleness, swelling, bumps, sores, bleeding, discharge, fraying fins or tails, stringlike attachments, cloudy eyes, protruding eyes or scales, not eating, erratic swimming, aggression, lethargy and leaping out of the water. Feeding your fish properly, maintaining a clean and stable aquatic environment and preventing stress from bulk water changes and overcrowding help keep your fish healthy. Will Plants in an Aquarium Raise the Nitrite Level? How Often Do Guppies Need to Eat?